Judging by the past few days' downpours, the rainy season is officially here, but with the Philippines being a tropical country, it's a given that we’ll still see--and feel--the sun most of the time. For car owners, that means investing in a good-quality tint for the cabin, particularly one that rejects the oppressive heat and harmful ultraviolet rays emanated by the sun. Miles & Levels, the authorized Philippine distributor of Sun-Gard window films, shares with us three of the most important things we need to know about car tints. 1. Darker is not necessarily cooler. Solar energy comes in the form of light but it's a common misconception that the darker the tint, the more effective it is at countering heat. According to Sun-Gard, the scientific truth is that most of the heat we feel all year round in the tropics comes from invisible light like infrared and ultraviolet rays. Premium tints are specifically designed to keep out heat, not just visible light, and a 'light' or nearly invisible tint can reject heat better than even the darkest shades of cheap, bangketa-bought tints. Sun-Gard claims its products score particularly well in solar radiation rejection as all of its tints, even the lightest shades, can "keep out up to 99 percent of cancer-causing ultra-violet rays." 2. Seeing less is seeing better. Glare, which is a problem in tropical countries like ours, is a genuine road hazard. It's distracting and obstructive, and if you catch it at the wrong time, it could get you in serious trouble. That's why major car manufacturers incorporate glare-reduction formulas into their windshields. Less glare means better visibility since it keeps the driver's eyes on the road. Premium tints are also much more effective at glare reduction than cheaper alternatives since glare is absorbed or dispersed in a manner that does not require an excessively dark shade to be effective. Admittedly, when it comes to glare reduction, dark shades typically work better but a premium light shade of tint will generally keep out glare better than even extremely dark cheap tints. 3. Your tint should last you a long time. Window tinting is a specialized and laborious undertaking. It isn't something you want to do regularly like an oil change or tire rotations. When you get your windows tinted, you want the tint to last and to perform as long as possible. Cheap tints have warranties that range from a few months to three years. In the Philippines, where the sun burns hot throughout the year, tint tends to become brittle and to peel sooner than it would in a country with a cooler climate. Premium tints typically carry a three- to five-year warranty. 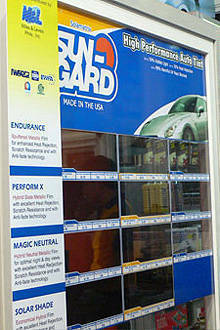 Sun-Gard offers a five-year warranty on all of its products despite being one of the most affordable premium tints on the market.